Soak tamarind in very little amount of water and keep aside. Heat oil in a pan and add cumin seeds + coriander seeds + red chilies, sauté well. Remove from the pan and transfer to a plate. Add spinach to the same pan and sauté until spinach becomes soft. Remove and transfer to the plate. Keep aside to cool. When all the ingredients cool down, grind them to a smooth paste by adding the soaked tamarind + cilantro + hing and salt as needed. Add very little water if needed. That’s all! 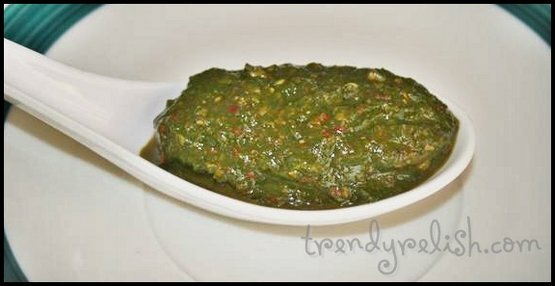 Great tasting spinach pachadi is ready to be eaten. This pachadi goes well with rice. 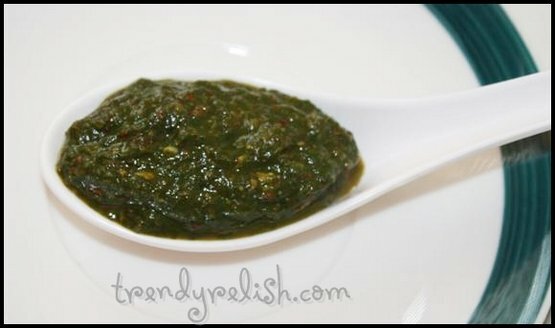 Super tempting chutney, definitely a fingerlicking dish. Excellent looking chutney. Wish I was there to get a taste of it. unique and delicious chutney !! This is so new to me..we try this for sure.. I love spinach. Thank you for posting this recipe - looks and sounds delicious, will try this tonight! Very well prepared Chutney, visiting you rblog first time.. Came through Siri's space I guess..